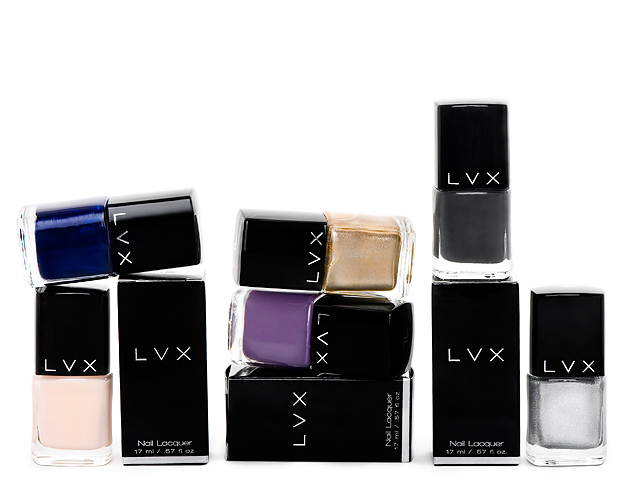 VEGAN LUXURY NAIL LACQUER BRAND LVX LAUNCHES THEIR WINTER/RESORT 2013 COLLECTION. LVX nail lacquer announces their third debut collection for the Winter/Resort Season. Chicago (November 2012): With immense excitement still circulating from the release of their gorgeous Fall Winter 2012 collection, LVX announces the debut of their third seasonal collection—Winter/Resort 2013. The Winter and Resort/Cruise season is interesting; the holidays have passed yet we enter colder nights and subconsciously yearn for brighter and warmer days. LVX has released six astonishing colors that are going to fulfill our transitioning wardrobe and slowly bridge us into early Spring. Tribute: This hue provides us with serenity and tranquility. This particular blue is extremely appealing because of its energetic attitude and texture. Luxe: Brilliant, extravagant and luxurious, luxe embodies all that is LVX. This quintessential shade is versatile and adaptable and enlivens our outlook with its stimulating radiance. Alchemy: Let this amazing shade eradicate the dark shades in your winter wardrobe. Alchemy is a flamboyant hue that pays homage to last Summer’s gold accessory trend. Aubergine: This affluent royal hue provides us with a mysterious and romantic attitude. This refined purple is both delicate and empowering. Dark Matter: A highly saturated gray with multifaceted undertones, Dark Matter is this season’s new gray and our alternative to black. Creamfields: A sophisticated neutral with a soft peach nuance, this wispy hue pairs well with every color in the palette and will span across the seasons. The long lasting, chip resistant and non-streak formula is free of harsh and toxic chemicals. LVX products are VEGAN and formulated without the use of Formaldehyde, Formaldehyde Resin, DBP, Toluene, and Camphor. The brand is dedicated to providing top quality, socially responsible, and eco-friendly, luxury products without compromising quality, durability and finish. LVX nail lacquer is cruelty free. All products are produced in the U.S.A. The new collection will be available December 7, 2012 on www.shoplvx.com. How amazing do these colors sound? They look so stunning! I'm never anything short of impressed with the color selection from LVX. Love the packaging of these nail polishes! New follower from the Blog Hop! Looking forward to more from your blog:). ooh. So excited for creamfields, these look amazing!